What can we say?! Trevor's been in the bike business for over 21 years. From humble beginnings in a small shop in Gosport to the Multi Franchise business that we are now. He knows pretty much everything Motorcycle and Motocross Racing related. If you are lucky and get him on the phone you'll probably get one of his Legendary Stories!! Still very much involved in the Shop on a daily basis and can often be found in the Workshop tuning cylinder heads or on the Dyno. Trevor has a riding history going back many years with much success, and he can still stretch the cables on a Motocross bike today. Sandra's been with Trevor since day one and keeps us all in-check. In the shop on a daily basis number-crunching in the Office and making sure that all is well within the mail order department. Often heard shouting at Trevor if he is telling one of his stories again !! 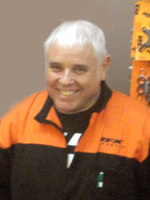 Martin joined us in early 2014, bringing almost 30 years of motocross experience including a 4 year schoolboy career from 78 to 82, a 2 year step into Adults between 94 to 96 then joining Portsmouth SSC in 2002 to where we are now. Along with riding he may also be known to some of you as the Portsmouth MXC Club Chairman for which he has held the post for the last 10 years. In addition to holding the post as club chairman he also is the clubs Vice President and more importantly the Chief Clerk of the course for a club that continues to grow in strength and depth and is now in its 43rd year of running. Of course, Martin's riding isn't just limited to offroad, and nothing beats the demo of the latest road bikes available at the shop! Rob is the longest serving member of the team here having been with Trevor since 1995 and in the Trade since 1985. The font of all knowledge when it comes to all things motorcycle, and there isn't much he doesn't know about them. 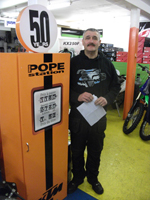 He is the main cog in our gearbox here, and is responsible for our Spare Parts department and the huge stocks of Motorcycle spares that we carry.When you phone and we have what you want, it's down to this man. Rob's been riding pretty much all of his life and has ridden pretty much everything from Solo Enduro, Sidecar Enduro, a brief spell on an ATV, Motocross and since 1995 Competing in the British Championship Sidecar Motocross where he is a regular Top Ten Finisher. Head of the Raceware department, Ryan is able to advise on all the top brands of clothing, helmets, boots, googles and protection that we stock in-store. Ryan is happy to advise on what works and what doesn't. Ryan also supports the Parts Team in taking and processesing your parts orders and has become a KTM product guru.An avid motorcross rider seen at the majority of southern events. The youngest and newest member of the team, Mark is very valued for his efficient picking and packing undertaken everyday to get your parts out as soon as possible, and is fast becomming a parts expert. Rob's been with Trevor for over 11 years. He is responsible for every single racing engine that leaves the premises. KTM Factory trained, Rob knows everything about making fast reliable racing engines. 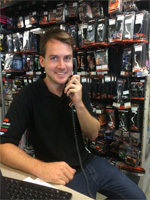 An extremely busy man but always has the time to help you on the phone. Rob's racing pedigree stems from years of experience from racing Grass track, long Track and Vintage/Veterans Speedway since 1974 !!. He can often be found at the Isle Of Wight Speedway meets on a Tuesday Evening where he is the Chief Scrutineer. 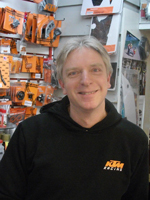 Kevin has been with Trevor for over 15 years and is responsible for everything Street Orientated, from Electric Bikes right up to the latest Street bikes. Kevin knows the KTM Engines like the back of his hand. 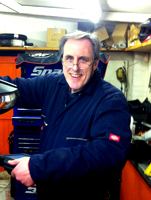 He is our MOT Tester with many years experience in the motorcycle industry. A wealth of race experience under his belt at an early age including European Supermoto Champion. "Baby P" (son of Trevor!) carries on the continued development of race bikes from suspension to race tuning and twin injection modifications to some of the worlds best rider's engines.